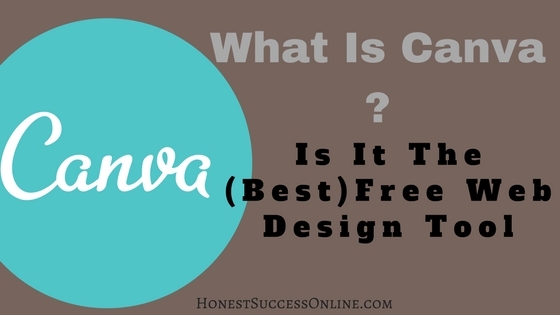 Home > Reviews > What Is Canva – Is It The Best (Free) Web Design Tool? What Is Canva – Is It The Best (Free) Web Design Tool? If you want to learn more about What is Canva, you have come to the right place. In a nutshell, Canva is a (forever free) graphic-design tool with an easy to use drag-and-drop interface. Canva.com was founded in 2012, and now, over 10 million people in 179 countries are using this incredible tool. It is suitable for people with little or no graphic design skills at all but also for professional users. I am not the most creative person in the world but using Canva has been so much fun. It has enabled me to create some pretty awesome designs. My post will not only cover why Canva is such an awesome tool. It also includes a short video tutorial on how to use Canva. I will also talk about Pros and Cons of this easy to use graphic design software. One thing is for sure, Canva is one of my most favorite free tools and I recommend it to anyone who needs to create stunning designs without spending any money. Read more about free tools and resources here. Before I go into more details on how to use Canva as a free web design tool, I quickly want to explain why the use of Canva is essential for you and your online business, whether it’s a blog, website, or social media account. Click here to create your free Canva account. Most of us are visual people and images help us to get a better understanding of the things we read. I use images to break up my blog posts to make them more attractive or to express what I want to say. I use images to break up my blog posts to make them more attractive, easier to read or to express what I want to say. In times of social media, you’ll need captivating images to promote your website and your content. 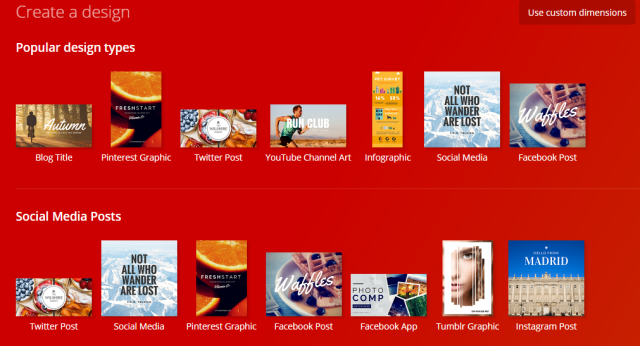 Pinterest is a prime example for promoting content via graphic designs. For many bloggers, Pinterest has become the number one source of traffic. So it is essential to have a tool that helps you to create images that stand out. The same applies for promoting your articles on Instagram or Facebook. Canva makes it easy to create exactly that: graphics that grab the attention of your audience. And best of all; it is free to use! No need to pay a graphic designer or to spend hours on creating Pinterest graphics. Once you have learned how to use Canva, it will only take you a few minutes to create a design. I suggest taking some time to familiarize yourself with this excellent web design tool. Have I mentioned, it is fun (and free) to use? With Canva you’ll be able to create designs for a variety of social media accounts but also letterheads, eBook covers and even write your resume. The dimensions match the requirements for a Facebook post, Twitter account or Pinterest graphics, just to name a few. You can also use custom creations which is fantastic for creating your website logo. Each theme has different requirements, so the customization makes things a whole lot easier. 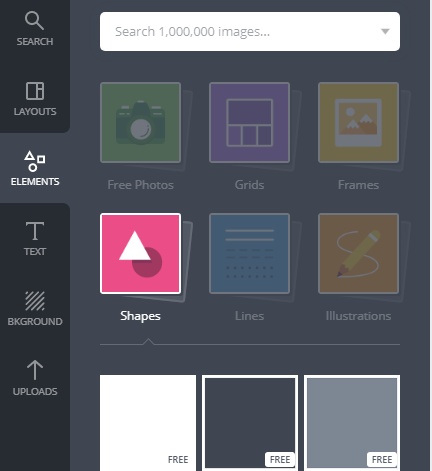 Canva offers templates for each design type, either free or paid ones. I do love using the free templates. You can change them any way you like, and they are great to get some design inspiration. Be sure to check out my short video tutorial where I show you how to create a blog title in under 3 minutes. The drag and drop interface is intuitive and easy to use. There is still a learning curve involved to get used to the different features, Canva offers. On the screenshot, you can see the dashboard with various options. You can search for images and illustrations (free and paid), but you can also download your own pictures. Choose from different backgrounds, fonts and elements like shapes, grids, icons, lines, and frames. When I started using Canva over a year ago, it took me at least half an hour to get one image done. Luckily times have changed and I get a blog title done in around 10 minutes. My advice is to take your time and learn as much as you can. Canva has tons of free video tutorials available as well. My tip: Develop a brand for your site by using certain colors and fonts that will represent your business. Take notes of the color codes and fonts so you can always refer back to it. It will save you tons of time. 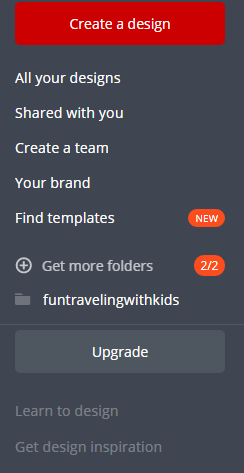 Canva makes it easy to get organized: With the free account you can create two folders, have a team of up to 10 members and find templates in a flash. Also, you can upload your own images and get 1GB of storage for photos and assets. The paid account is called ‘Canva for Work’ and costs either $12.95/month or $9.95 if paid annually. You can try it out for 30-days. I have tried the paid account but didn’t think it was necessary for my needs. Once you have finished your design, all you need to do is give it a title and download your masterpiece. You can choose from JPG, PNG, PDF standard or print. You can also share your design straight away via Facebook or Twitter. Lastly, share the design with your friends and ask for their feedback. They can either edit or view; it is up to you. Canva is free to use. The free account even includes images, templates, icons, and illustrations. You can choose from designs that have already the correct dimensions for each social media platform. Create an abundance of different marketing materials, blog headers, logos and so much more. Getting organized is easy with your own folders. Free video tutorials are available to make the most of this fantastic tool. Easy to use drag-and-drop interface. There is an app available for iPad and iPhone so that you can create a design ‘on the go’. You can download your design in different file types, even as printable pdf. Easy sharing with friends and on FB and Twitter. 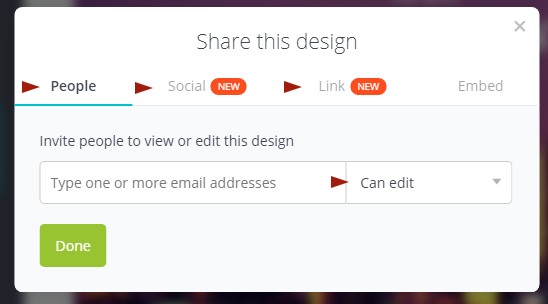 Canva is adding new features on a constant basis, so it is always exciting to see what comes next. To be quite honest; I can’t really find any, not even a tiny bit. The only suggestion would be to see an app for Android phones shortly. Otherwise, come on, it is free to use with such incredible features, and no upsells whatsoever. By the way, Canva has no affiliate program so I won’t earn a dime with this review. 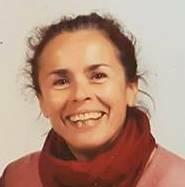 I feel it is so important to share this amazing tools with you, especially when it helps you to get closer to your online success. I do love it and hope; you give it a try. Canva is an amazing graphic design software and in my opinion the best free web design tool on the market. There are plenty more around, but Canva is hard to beat. It is so easy to use with its drag-and-drop interface. The features are fantastic, and there isn’t really anything I can fault. The video tutorials are helpful, and it really pays to take out the time to learn about Canva when you get started. It’s an essential tool for online marketers, bloggers, affiliate marketers and so on; its suitable for newbies and professional graphic designers alike. You don’t need to spend any money to create great visual designs. This is especially important for people who don’t have a huge budget. Make your brand stand out on the internet and various social media platforms. Dive into it and discover your creative side. And most of all, have fun with this fantastic tool. Please let me know if you are using Canva or any other graphic design tool. I’d love to hear from you! 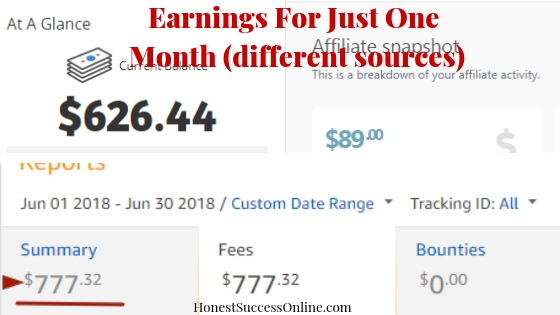 Do you want to learn more about affiliate marketing and how to build a successful online business? Read more about my #1 recommended online training platform – click here. Next Post Leapforce Review – Is It A Legit Work From Home Opportunity?